- Season well with salt and pepper for the best results. - Make sure you are careful around the oil, particularly when turning the saganaki over in the pan as you don't want it to splash on you. 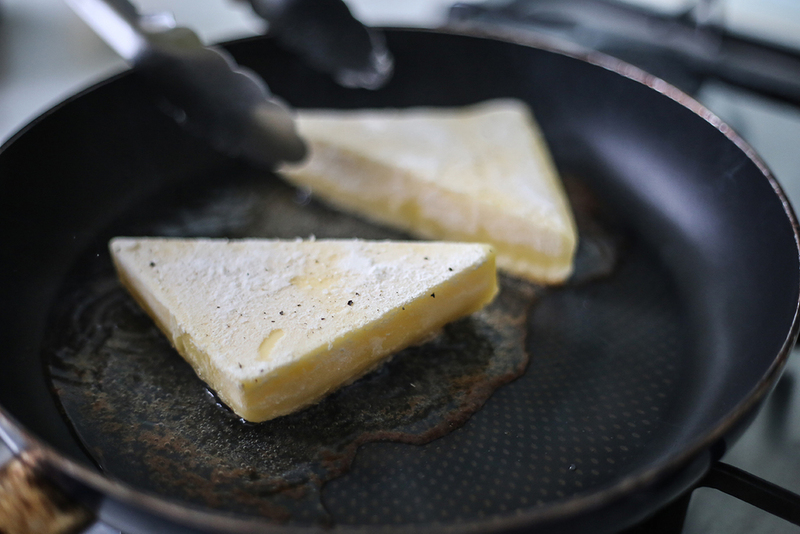 - Be aware the the saganaki will be extremely gooey in the middle and can easily fall apart, so make sure you handle the floured Biocheese pieces delicately as you are cooking them. 1. In a small frying pan, add olive oil and place stove on medium heat. 2. Dip the pieces of MyLife Biocheese in water, and then coat in the flour. Season pieces well on both sides with salt and pepper. 3. Add floured pieces of Biocheese to the pan. Cook for three minutes each side, or until the pieces are golden on both sides. You may need to use both a spatula and tongs to flip the Biocheese over. 4. Remove Biocheese from pan and serve sprinkled with parsley, with lemon wedges and warm bread. Enjoy!